St Aubin Melon Liqueur – Bring on the Summer! 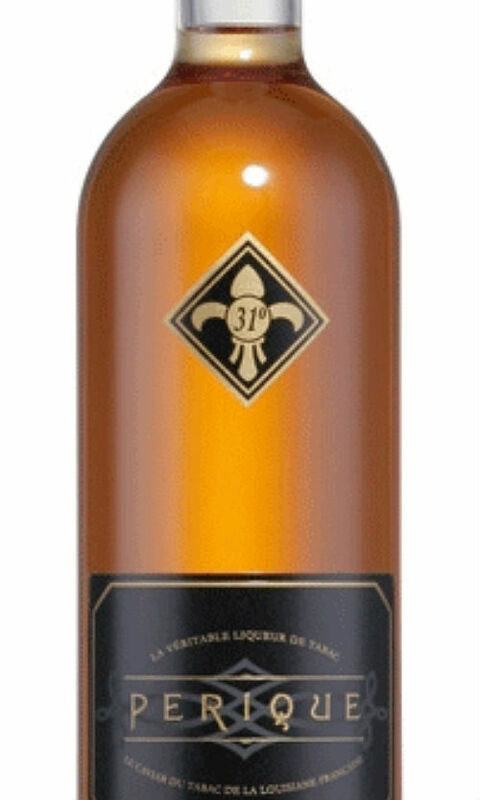 I`ve been waiting for the warmer temps to arrive for my review of St Aubin melon liqueur which I think is just perfect for those fruity refreshing and a bit lighter summer drinks. Melon is to me – summer…..it´s such a refreshing fruit to eat in the heat. St Aubin plantation located on southern Mauritius has been cultivating sugarcane since 1890 and takes it´s name from one of it`s first owner Pierre de St Aubin. On the estate there`s both artisanal and a traditional rums made but they make more than rums…. 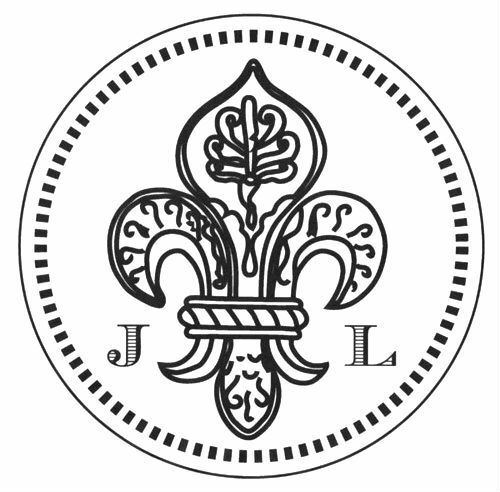 They also have a tea plantation, Bois Chéri and a vanilla plantation and that`s the vanilla they use in their vanilla flavored rums. The water used in the rum making comes from their own spring water from Bois Chéri. It`s all local produce here which is something i like. And now they also have a melon liqueur! The liqueur smells like fresh cut up honeydew or cantaloupe melon…….and the taste is light and fruity and not too sweet, I like that! it can even be drunk neat and still be refreshing. In cocktails it shines and i`m sure it would go very well in all kinds and types of cocktails. 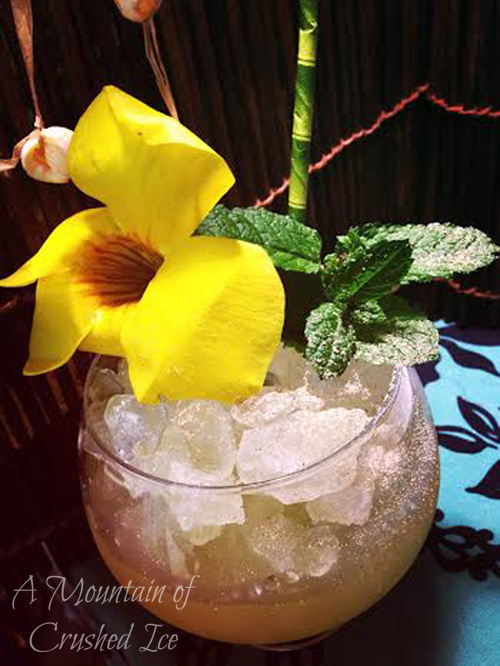 Shake with ice cubes and strain into a goblet with cracked ice and garnish with mint and tropical flower. Top off with a dust of grated nutmeg. 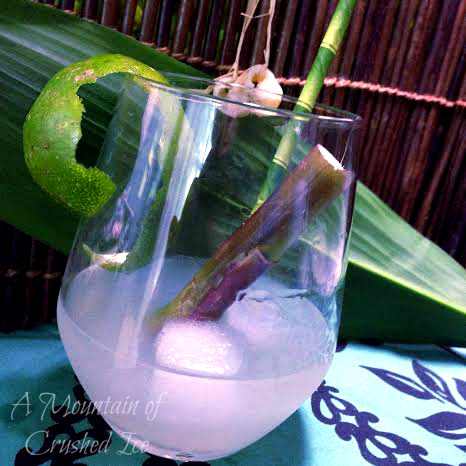 This drink turned out very fruity and refreshing, perfect for hot summer days! A cocktail for the setting of the sun…..
0.5 oz grenadine, preferably hibiscus grenadine, home/house made or BG Reynold`s. Muddle 2-3 lime wedges with grenadine and 8-10 mint leaves in a shaker. Add the muddle mix into a tall glass and add crushed ice almost to the top. Shake the rest of ingredients, strain and pour into the glass. Give it a little stir and add more crushed ice to fill. 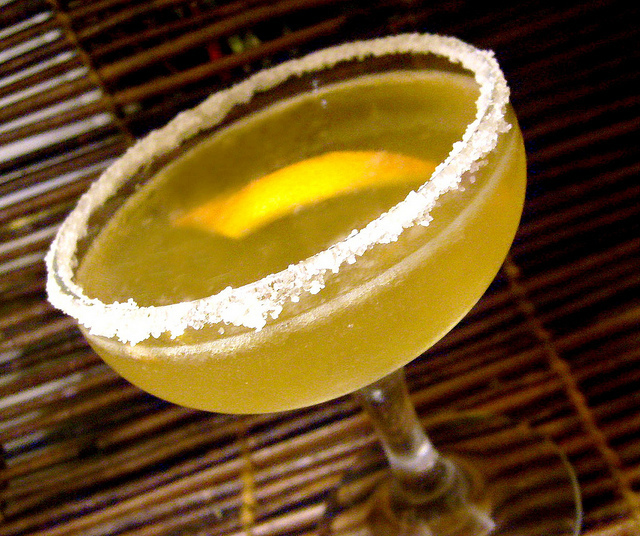 Top with a little Club Soda, and if you wish, add a float of JWray on top. Garnish with mint and orchid. 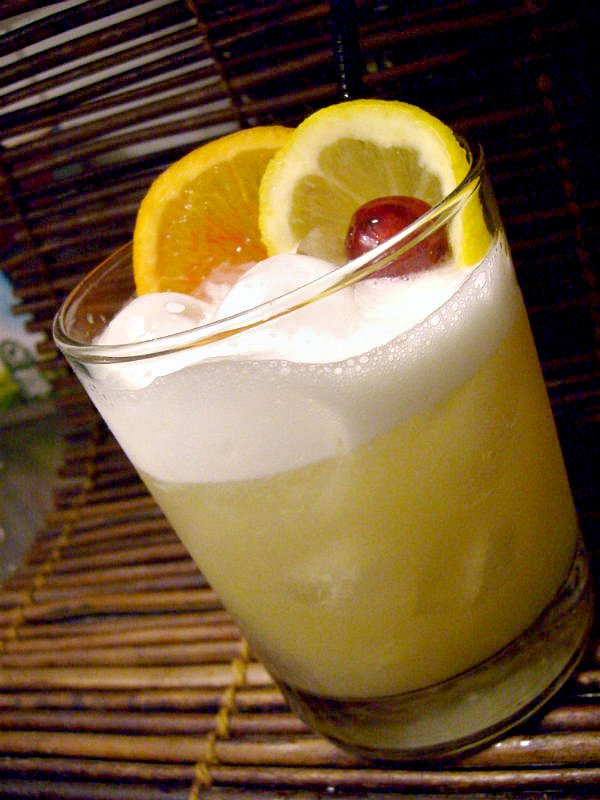 The melon is not obvious but it`s there and this drink is very refreshing. This drink has a French name, “Ti Melon” means simply “little melon” (petit melon) and is a fresh green fruity take on the Ti Punch with added melon liqueur, ice and more lime than you usually find in a Ti Punch, and the drink turned out very tasty!